i've been anticipating the arrival of this month's issue of Print, mostly because i've been excited to see the regional design annual winners, but two other things struck me before i could even get to the award section. "people today don't just appreciate good design - they expect it." as a person who strives to create work - and generally live life - in a way that more then simply, meets expectations, i find this quote surmises what i've discovered in my limited experience and it also challenges me. how inspiring! and 2. tur-da! 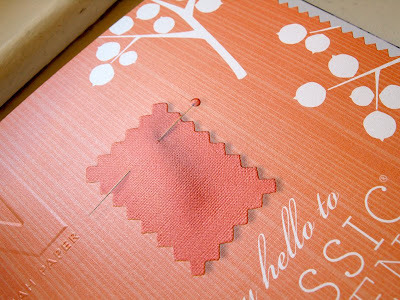 this amazing ad from Neenah Paper announcing the addition of a pearlized linen paper to their line: way to combine my two favortie things. side note: the typography and pattern looks straight out of Martha Stewart Living. it's beautiful. and just examine the texture . 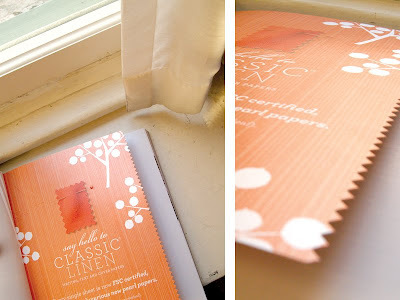 . . the little swatch of "linen is embossed" to feel extra linen-y, how delightful. I can't wait to use this paper for a future project. also i really love this color right now. I too love the colour and, like you, I really love that pearlized linen. I'm going to go check their website out right now.